We’ve been totally spoiled this fall with sunshine and warm temperatures. We’re heading toward the end of November and you can still get tender greens at the farmers’ market. That will all be over soon I’m afraid and the homegrown greens will have to wait until next spring. 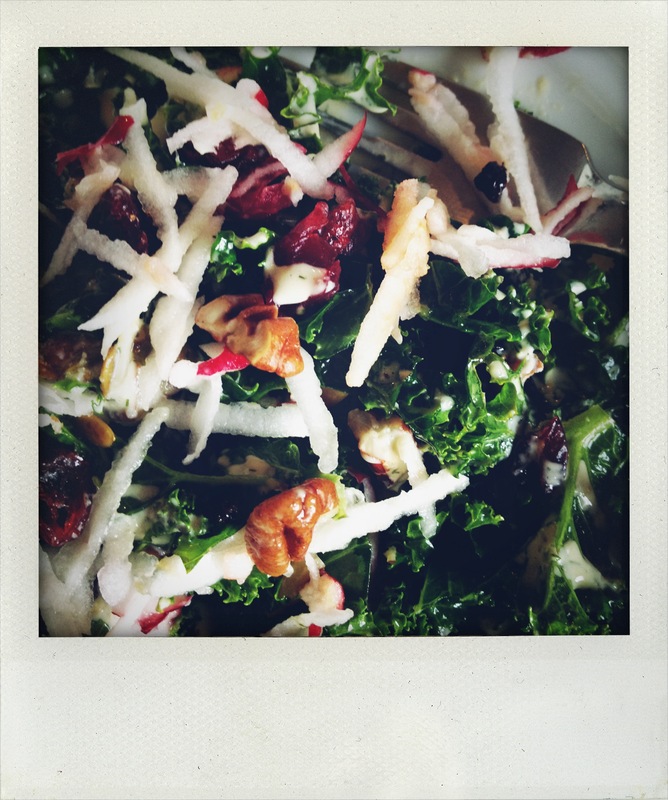 The tender ones that is, but we’ve still got kale and chard and the hearty greens that work so well steamed, in soups, and in salads like this winter kale salad with a lemon dill tahini dressing chock-a-block full of other goodies like cranberries and pecans. Wash and dry the winter kale. Cut it in thin slices. Toss with lemon juice, olive oil, and sea salt. Massage the lemon juice, oil, and salt into the kale with your hands to tenderize it. Go for it. It’s therapeutic. Then let it sit for 20 minutes or so. Add the pumpkin seeds, cranberries, currents, and pecans. Toss. Place in individual bowls or plates. Drizzle liberally with dressing and then top with shredded apple. This is a must-have for every refrigerator out there. 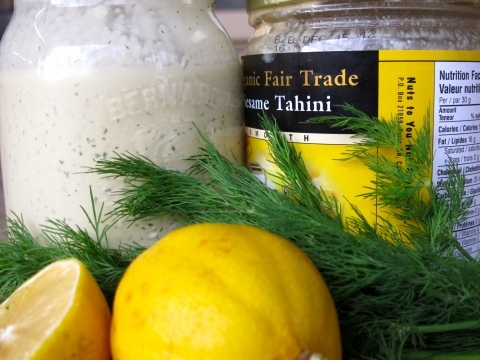 Make a big batch and keep it handy because it’s fabulous on salads, winter kale, steamed veggies, falafals, sandwiches, or even a dipping sauce for whatever tickles your fancy. Make it a bit thicker and just thin out what you need with a little water for salads when you want to use it as a dressing. Thanks Sandra! It’s so great to get feedback from folks so I know if the site is useful, inspiring, and otherwise a positive force in this world. I appreciate you taking the time to send me a note and thanks for following v:gourmet.